Political Sidebar is a weekly round-up of commentary from elected officials around the Chicagoland area discussing topical issues affecting their communities. 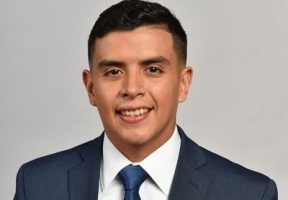 State Rep. Aaron Ortiz D-Chicago, voted to pass legislation that would prohibit discriminatory employment practices which often lock women, particularly women of color, into a lifetime of unequal pay. “It’s unacceptable for women to earn less than men, an inequity that’s much larger for Latinas,” said Ortiz. 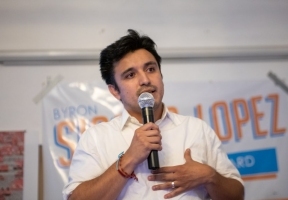 “I’m proud to have stood with women all across Illinois, and I will continue to stand against sexist and discriminatory practices, ensuring we foster a culture where women are paid fairly for their skills and contributions.” Ortiz backed House Bill 834, which will prohibit employers from asking job seekers to submit their salary history. The Ortiz-backed measure will be especially helpful for Latinas as the inequity in pay is nearly double what it generally is for white women. 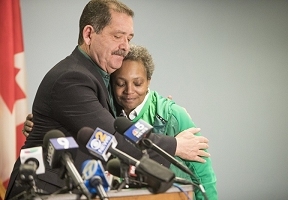 Congressman Chuy Garcia endorsed Lori Lightfoot for mayor at a Sunday press conference. Congressman Garcia joins Our Revolution Chicago, LiUNA Chicago Laborers’ District Council, Plumbers Local 130, and State Representative Kelly Cassidy, among others, in endorsing Lightfoot in the past week alone. “Chicago needs a fresh start,” said Congressman Garcia. “Chicago needs a new generation of leadership. It needs to break from the old vestiges of old machine politics, and is close to making that a reality. Chicago needs a government where big money doesn’t call the shots, doesn’t exert its influence and set the municipal agenda. Chicago needs a laser focus on public safety and creating good-paying jobs for people in all of our neighborhoods. It needs to create opportunities for neighborhood revitalization and prosperity. 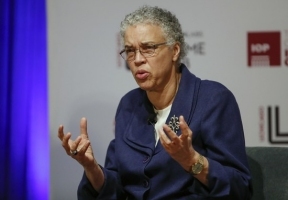 Mayoral candidate Toni Preckwinkle received the endorsement of the Illinois Federation of Teachers. The union joins Teamsters Local 700, IUOE, SEIU, Painters Council 14 and the Chicago Teachers Union, UFCW, and Ironworkers Local 63 in a coalition of working families supporting Toni Preckwinkle for mayor. 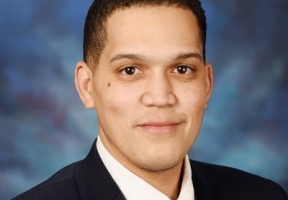 “As a former teacher, Toni Preckwinkle understands firsthand the joys and the challenges in our public schools and shares our commitment to make sure Chicago students have what they need to succeed,” said Dan Montgomery, president of the Illinois Federation of Teachers and a high school English teacher. A resolution sponsored by State Senator Robert Peters (D-Chicago) urges the United States Congress to guarantee automatic citizenship for children adopted by a U.S. citizen. “I know from first-hand experience that the life of an adopted child is difficult enough without the possibility of being stateless,” Peters said. “The protection of the U.S. government should not be denied to children because of things that happened before they were born. Granting them citizenship is the right thing to do.” House Joint Resolution 24 states that both chambers of the Illinois General Assembly regard the granting of citizenship to all qualifying children adopted by a U.S. citizen as a civil right regardless of the date the adoption occurred, and that they condemn the deportation of individuals who were adopted into American homes and therefore have expectations of citizenship.